A Wine spectator Magazine ‘Must Visit’ winery. 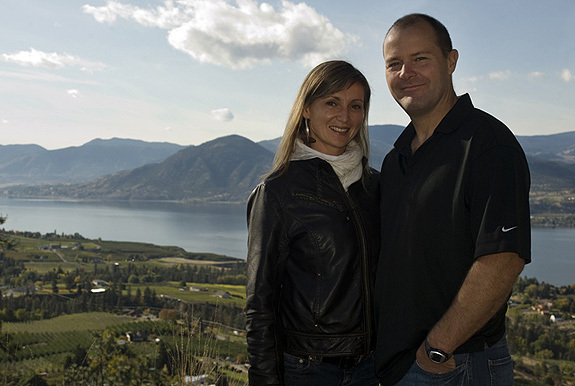 Miranda and Del Halladay founded Elephant Island Winery in 1999 in partnership with Miranda’s grandmother Catherine Wisnicki. West facing on the Naramata bench the site is in the heart of one of the best fruit growing regions in the world. A passion for fine alcohol and the whimsical setting inspired Miranda and Del’s journey into the world of winemaking and the world of wine. The foray into fruit wines was guided by Miranda’s grandfather Paul whose recreational pursuit of fruit winemaking and micro – distilling left a heritage rich in memories and taste adventures. Grandfather Paul had the foresight and vision to believe there was a market for well crafted fruit wines and they were in the middle of an orchard. Paul’s recipes brought over from the old world laid the foundation for the fruit wines at Elephant Island. Not satisfied with their reputation as one of the best orchard wineries in Canada they planted a smallish plot of wine grapes. These wine grapes led to the grape wine program known as Unconventional Wisdom and the two well received wines called ‘I Told You So’ and ‘Naysayer’.